In the city center, just 2 minutes walk from the central train station in Eindhoven! The venue Effenaar has two big cloakrooms to drop your jacket & small bags but also a wall of lockers. However: it’s not allowed to bring large bags or backpacks to the venue. Maximum size: a4 format, 10cm wide. Please leave larger bags at the lockers in the station or in your hotel room. You can pay for your drinks and food at the Effenaar with cash and bank cards (with the Maestro logo). 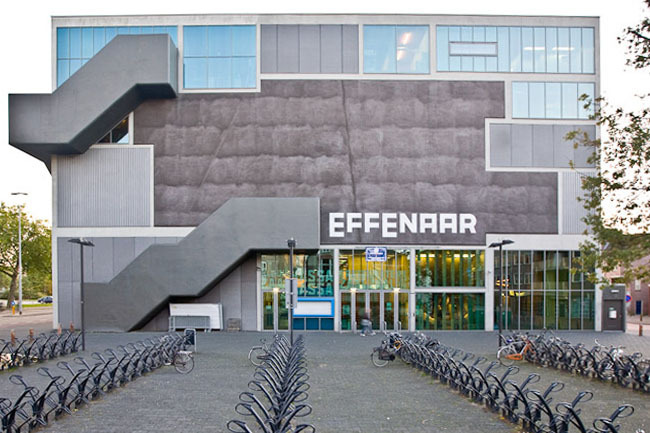 The Effenaar however, does not accept creditcards like Mastercard and Visa. We suggest you bring enough cash to the venue if you have a credit card. Take a flight directly to Eindhoven or book a flight to Amsterdam, Rotterdam, Brussels, Dortmund or Düsseldorf. Please note that there are several public parking lots in the Eindhoven city center and also directly at the central train station and opposite the Effenaar venue. Warning: Unfortunately Eindhoven is not the safest of all cities in The Netherlands. So please do not leave any valuables inside your vehicle and note that the Effenaar venue is not liable for any theft or damages in case something unforeseen should happen. If you walk from the Effenaar venue towards the central train station of Eindhoven you should find cabs on both sides of the building.